Summary: This baffling UFO case began on November 5th, 1975, in northeastern Arizona's Apache-Sitgreaves National Forest. A logging crew of 7 men were working on a government contract, clearing forest. The men loaded into a single pickup truck leaving work for the day. As they started their journey home, they saw, not far from the road, a "luminous object, shaped like a flattened disc." According to the crew, one of their members, Travis Walton, exited the truck and approached the object on foot, at which time he was allegedly struck by a brilliant bluish light or flash and hurled to the ground some distance away. In fear, the other crew members fled the scene. After arguing among themselves, they returned after a short period of time to find no trace of the UFO, or of Walton. The driver of the truck was Mike Rogers, the crew foreman and a personal friend of Walton's. 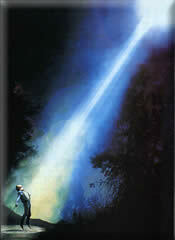 While fleeing the scene, Rogers reported looking back and seeing a luminous object lift out of the forest and speed rapidly toward the horizon. He, along with the other five witnesses, would eventually be subjected to polygraph (lie detection) examinations regarding the event, the successful outcomes of which catapulted the case into the national spotlight. Walton reappeared five days later, confused and scared, with fleeting memories of alien entities, and descriptions of the inside of their craft. He was also subsequently subjected to a number of controversial polygraph examinations. As the first seriously investigated UFO event to involve the disappearance of an individual in conjunction with a UFO sighting, the Walton incident put the honesty of UFO claimants, as well as the validity of lie detection evidence, squarely in the spotlight. A total of thirteen polygraph examinations have been conducted in association with the case, tests which have been the subject of considerable discussion and acrimonious debate. Consistent Description of Alien Craft: The six witnesses (Allen Dalis, Dwayne Smith, John Goulette, Kenneth Peterson, Mike Rogers, and Steve Pierce) of this controversial case, described the craft in personal, yet similar terms. Rogers' description depicts the craft as a "large, glowing object hovering in the air below the treetops about 100 feet away." Dwayne Smith described the craft as "smooth and giving off a yellowish-orange light." An assessment of the Walton case begins with the chronology of the initial encounter on November 5th. The seven witnesses described the UFO as a "large, glowing object hovering in the air below the treetops about 100 feet away" (Mike Rogers) which was "smooth and giving off a yellowish-orange light" (Dwayne Smith). Other descriptions by the various witnesses included "unbelievably smooth", "flattened disc" with "edges clearly defined". Rogers and Walton estimated an overall diameter of about twenty feet. As Walton approached on foot across the clearing, the "UFO began to wobble or rock slightly", and then emitted a "bluish light [that] came from the machine", "a blue ray shot out of the bottom of that thing and hit him all over", "that ray was the brightest thing I've ever seen". This light sent Walton "backward through the air ten feet", "hurled through the air in a backwards motion, falling on the ground, on his back", "flying -- like he'd touched a live wire". "The horror was unreal." "During the pretest interview, Mr. Dalis related the following events that occurred on that day. Mr. Dalis said they had finished work for the day and were heading home. It was almost dark. He saw a glow coming from among the trees ahead of them. As they came to a clearing, he saw the object he called a UFO. Mr. Rogers was slowing the truck down to stop as Travis Walton exited the truck and began to advance towards the UFO in a brisk walk... Mr. Dalis described the UFO as being a yellowish white in color. He said the light emitting from it was not bright but a glow that gave off light all around itself. Mr. Dalis saw Walton reach the UFO, stop and look up at it. He said it looked as if Walton was standing there, slightly bent over, with his hands in his pockets. Mr. Dalis said the UFO began to wobble or rock slightly and he began to become afraid. He put his head down towards his knees. As he did so, a bright light flashed that lit up the area, even the inside of the truck. He immediately looked towards the UFO. He saw a silhouette of Walton. Mr. Walton had his arms up in the air... Mr. Dalis turned towards Mr. Rogers who was in the driver's seat and yelled for him to 'get the hell out of here'..."
"...Mr. Rogers was on the opposite side of the truck from the UFO. He had to bend over slightly to view it in its entirety through the truck windows. He described the UFO to be glowing a yellowish tan color. 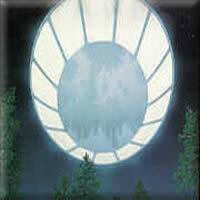 He could not say if the light emanated from within the UFO or was a lighting system outside, that lit up the UFO. He did say he could see the shadows of the trees on the ground, around the UFO. He said it was round and about 20 feet in diameter. He said the UFO was about 75 to 100 feet from the truck... As Mr. Rogers started to move the truck a brilliant flash of light lit up the entire area, even inside the truck. It was described as a prolonged strobe flash. He did not see a beam of light emit from the UFO and hit Walton. As the flash occurred, Mr. Rogers turned around in his seat to look at the UFO again and saw Mr. Walton being hurled through the air in a backwards motion, falling on the ground, on his back. At this time, Mr. Dalis and someone else yelled to get the hell out of here..."
Upon returning to the scene, the crewmen searched briefly through the woods, calling Walton's name. They then proceeded down to the main road and after some debate, decided to call the police and ask for assistance. They were first met by a Deputy Ellison and subsequently by Sheriff Marlin Gillespie, who would later describe the crewmen as apparently sincerely distressed. The question at hand was; "Where was Travis Walton?"